This page is only intended to be a resource for those with food allergies and intolerances, and should not be considered medical advice. Talk to your doctor if there has been no official diagnosis. Food allergies and food intolerances are usually discussed as two separate topics. With a food allergy, the offending food is considered a foreign substance to the body and the body generates an immune respose. With food intolerances, on the other hand, the problem comes from a component of the food that the body has problems handling. For example, the body may not be producing an enzyme that is needed for digestion. Peppers are another ingredient most barbecue sauces have that give the sauce that spicy zing a lot of people crave. 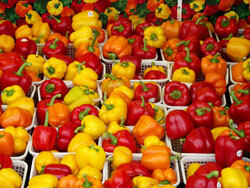 Unfortunately, many people are allergic or intolerant of peppers as well. The WrongDiagnosis website has an excellent section that discusses everything from symptoms of to complications from a food allergy to bell peppers. If you have an allergy or intolerence to onions or peppers, you are probably very good at reading labels. Isn't it amazing how many foods have onions and peppers in them? Be careful of labels contain the entry "spices". In our experience, those "spices" may contain small amounts of onion powder or paprika which is in the bell pepper family. If you have given up eating barbecue sauce because of food allergies or intolerances to peppers and onions, then try Hack's BBQ Sauce. Here is a blog post titled, "Finally, A BBQ Sauce Safe for Digestive Disorders " written by Kevin Sandridge of The BBQ Smoker Site for Hubpages.com. In this post he addresses people with food allergies, specifically those with allergies to peppers and onions, and gives Hack's BBQ Sauce a favorable review. If you have food allergies and are in the dating scene, you can look for others with the same condtion at the Singles with Food Allergies website. The Allergic Living website contains a wealth of information about allergies in general. This site also has a forum where you can share experiences with other people. Raw onion is a problem for acid reflux sufferers. Here is a complete list of foods to avoid. There is some research that shows food allergies are a potential reason behind Irritable Bowel Syndrome (IBS). About.com has a very informative article about an IBS diet. This site also has a list of the top 10 gastrointestinal irritants that may be trigger foods for IBS. A blog about about one man's discovery of his intolernace to capsaicin, a chemical found in chili peppers.